Inflation didn’t fall as much as many expected during the financial crisis, when the economy faltered and unemployment soared. It hasn’t bounced back as they predicted when the economy recovered and unemployment fell. The conundrum challenges much of what central bankers thought they understood about the world, as well as their ability to do their job. How will they know when to raise or lower interest rates if they’re unsure what causes consumer prices to rise and fall? “There is definitely less confidence, a lot less confidence” about how inflation works,James Bullard, President of the Federal Reserve Bank of St. Louis, said in an interview here Friday. The economy’s performance has “really challenged” the notion of a strong link between unemployment and inflation, Mr. Bullard said on the sidelines of the conference. The existence of such a link was also challenged in the 1970s, an era of high inflation and high unemployment. Today’s uncertainty is a turnabout in a community that gave itself credit for figuring out and taming inflation after bringing it down sharply from double-digit rates in the 1970s. Maybe they never did understand! Let me help them with a hint. Hint: The inflation dynamics is closely tied to the Fed´s success in obtaining NOMINAL STABILITY! The charts illustrate. 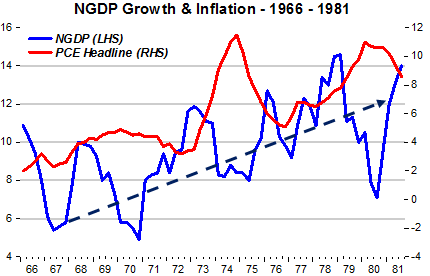 Immediately after WWII and extending to the mid-1960s, inflation was “low” (average=2%) but volatile (St Dev=2). Average NGDP growth was 6.3% with St. Dev. of 4.5. That compares with “low” (average=2.5%) and stable inflation (St Dev=1). Meanwhile, NGDP growth averaged 5.7% but it´s standard deviation (1.4) was just one-third the standard deviation of the 1948-65 period. What have we had for the past 9 years, since Bernanke (followed by Yellen) took over the Fed? The chart shows that inflation has been a little “too low” (average 1.8%) and stable (St Dev=1.1), while NGDP growth has also been “too low” (average=3.2%) and only relatively stable (St Dev=2.3). You could say that there has been nominal stability. Unfortunately, the stable LEVEL path is “too low”! 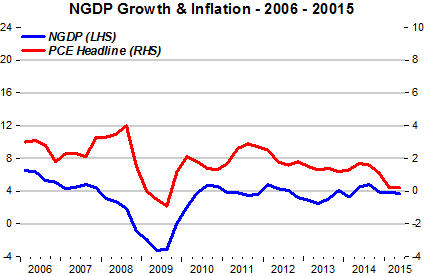 The market monetarist conclusion is: Target a level path for Nominal Spending (NGDP). Inflation will remain “low” and stable, but the rest of the economy will feel much better! To cap it up, the next chart allows you to get a feel for the “dynamics of inflation” when NGDP growth rides on a rising trend and when inflation is “spiked” by a couple of “strong” oil shocks! The NGDL level target story is certainly much “cleaner” than the Phillips Curve (growth/low unemployment) drives inflation story. This entry was tagged Inflation Dynamics, Jackson Hole, Phillips Curve. Bookmark the permalink.